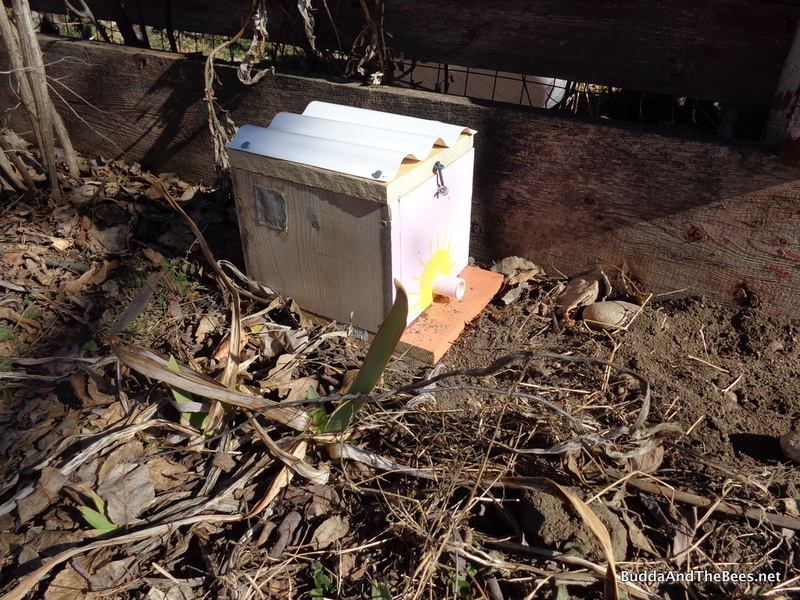 Last year, I had every intention of building a bumble bee house, but many things slipped due to other circumstances. This year, I was determined to get one built, so I dragged out the table saw and put one together. I was able to make it with scrap wood I had lying around from making my top bar hives over the past few years. I had an old latch from my grandfather that I used to lock the lid down and used paint left over from my hives, so it didn’t cost me anything to build this. 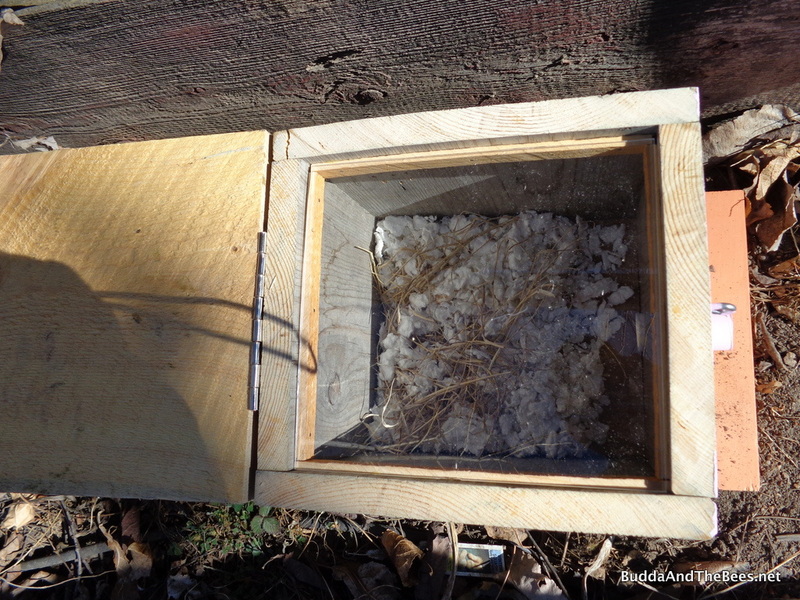 I used the instructions put out by the Xerces Society for making the hive. (There is also a section on building nest sites for native pollinators in their book, “Attracting Native Pollinators“). There are other designs, but basically, you have a box, with an entrance, some vent holes and a lid. The main difference in designs seems to be the addition of a vestibule in front of the nest where the bees can defecate before entering the main nest area. I didn’t put one in for my simple design – maybe for the next one. Inside the nest, I put some small animal bedding left over from our little gerbil who passed away last year. I also added some dry grass to make it more “natural”. I hope that a bumble bee queen finds this before a mouse decides it would be a wonderful place to nest! I also added a piece of Plexiglas on the top, so I can peek inside occasionally. I’m not sure this will be practical if there are bumble bees in there. I’ve heard they don’t like being disturbed. A look inside the nest. I placed the hive at the base of the fence at the back of my yard. Lots of sites/videos talk about placing it along a hedgerow or some other feature that can be used as a landmark. Unfortunately, a lot of the “hedges” I have in my yard are seasonal (get cut back each year) or are in full sun. And, since I wanted to get this hive in place before I am able to get out and trim my hedges, I wanted a place that wouldn’t be disturbed if a queen set up in the hive in the next couple of weeks. I’m worried that it might be too shady in the morning, but I’ll just have to wait and see. Once the garden plants grow up, it should be nicely sheltered and shaded appropriately. Nest placed in the back of my vegetable garden at the fence line. 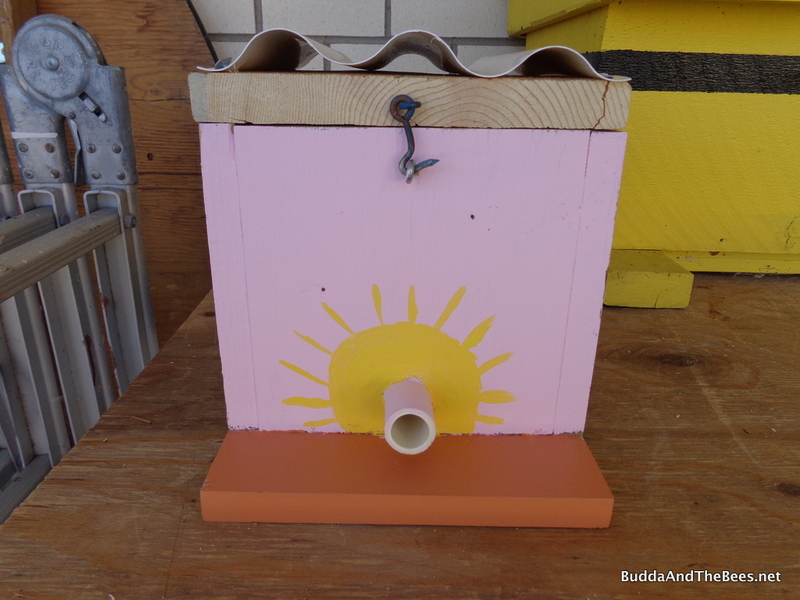 After I got it all built, I kept Googling around for more information on bumble bee nests and found a nice site with plans and more information on where to place your hive. Another design that I found on this site uses an upturned flower pot. I had a bunch of pots sitting around, so I thought I’d give this a try. The bees enter through the drain hole (now at the top). I placed a few small rocks around the hole and covered that with a piece of tile leftover from our bathroom remodel. That leaves a gap for the bees to crawl through and they can defecate outside before entering the hive. 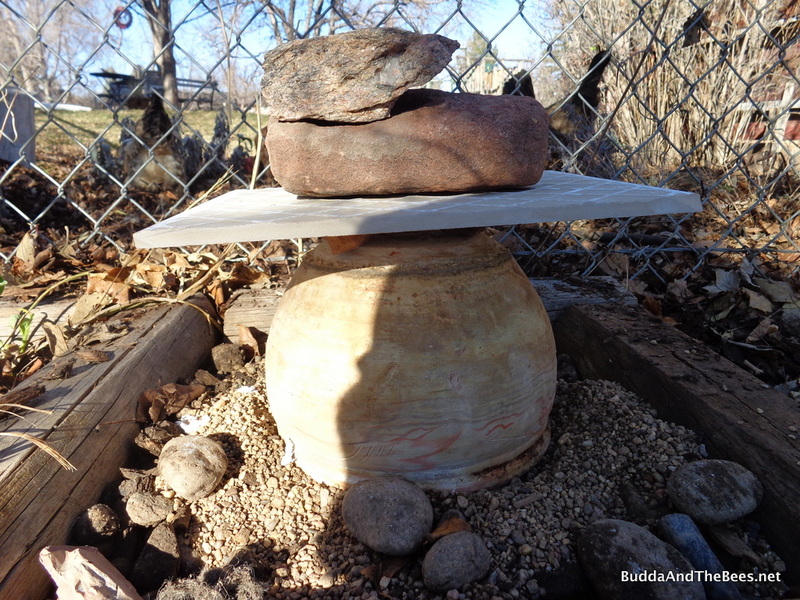 A couple of rocks on top hold the lid in place. Duncan’s chickens were very curious about what I was doing as I was setting it up. 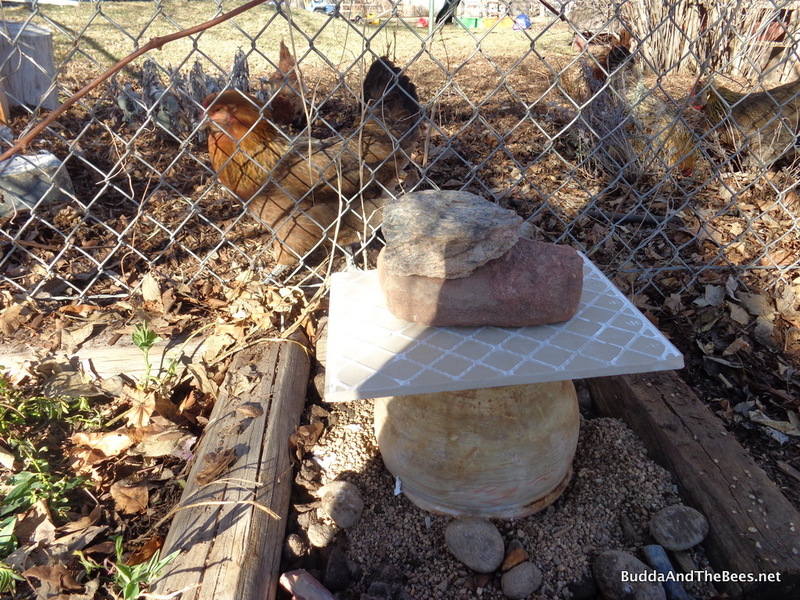 I put some squeegee rock underneath for drainage and I think they thought was chicken feed. Chickens interested in what I am doing. It can take a year for bumbles to take up residence and it could be that they may never use these at all. But, ever since I started keeping honey bees, I’ve noticed more bumble bees in my yard so I’m hopeful. They particularly love the catmint and blue mist spirea that I’ve planted for my bees. Unlike honey bees, only the bumble bee queens winter over. In the spring, you’ll see the big queens flying around looking for nesting sites after coming out of hibernation. Once they find a spot and build a nest, they’ll lay eggs and start raising baby bumble bees. They have to do all the work at the beginning- building the nest, feeding the young foraging for food. You’ll see them out collecting pollen to feed the new bees. When the babies are old enough to get out and forage, the queen will stay in the nest, laying more eggs and making new baby bees. What you’ll notice, if you are paying attention, is that there are a few big bumble bees (the queens) early in the season and then you’ll see more smaller bumble bees later in the season. I love watching the large queens packing pollen in their leg pouches and flying about. To me, they are like big C130 planes – so big and weighted down, it’s a wonder they can get off the ground! A couple of years ago, we first noticed a large queen buzzing around our yard. Diana named her Queen Jezebel and in the ensuing years, we’ve noticed more Jezebels flying round in the spring. I’m hoping this year, one of them will find the nest boxes I’ve made appealing, settle down and bring me home some baby bumble bees. Hee hee! I remember that cartoon! My sister and I used to sing that song non-stop, too. Hopefully, you won’t clap your hands when you get some bumblies. Your bumblebee house looks fabulous! Love that sun around the the entrance! It looks like a pretty easy project to make, too. Maybe one of my kids would like to build that. I especially like the flower pot house — It would take minimal effort on my part, but I could get my daughter to paint it, which would give my “border collie” a good 45 minutes of work to do. It would be a great project for the kids – either woodworking or flower potting. I should get Duncan and his sisters on that. We could have a bumble bee farm! Thanks for the article. They may not be aerodynamic, but that makes them even more fun to watch!